Based in Peterborough, Ontario, we specialize in labyrinth design, custom installation and guided labyrinth experiences. Please enjoy our site, and we hope that together we can explore the joy and wonder of labyrinths! 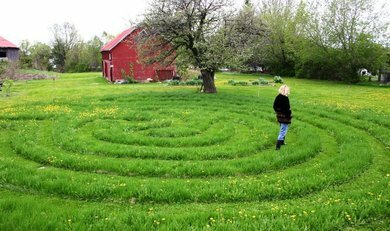 "In 2006, as part of a collective that created a municipal labyrinth in Minden, Ontario, my passion for labyrinth design and its use as a spiritual tool was ignited. I have a mysterious connection to labyrinths that comes from an ancient source, a deep intuitive knowing and a love of the land. Growth and self-reflection have emerged in my life through the wonder and beauty of nature. For me, both labyrinth design and labyrinth walking are a meditative process, placing me firmly in the NOW. Since 2006 I have collaborated, designed and installed many labyrinths in my local community and beyond. 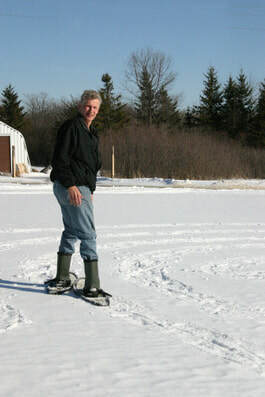 Creating labyrinths is a four-season activity, and in winter, with snowshoes I love to spontaneously create giant labyrinths in snow-covered fields and open spaces." Visual artist, author and cultural creative Pegi Eyers is occupied with contributing to the paradigm shift and working with the decolonization process in herself and others. A Celtic Animist who sees the world through a spiritual lens, she is a devotee of nature-based culture and all that is sacred to the Earth. Author of Ancient Spirit Rising: Reclaiming Your Roots & Restoring Earth Community, she examines cultural appropriation, the interface between Turtle Island First Nations and the Settler Society, social justice, earth rights and the holistic principles of sustainable living. She is an advocate for our interconnection with Earth Community and the recovery of authentic ancestral wisdom and traditions for all people. Pegi Eyers & Robert Hood live in the countryside on the outskirts of Peterborough, Ontario where they enjoy a permanent triskele labyrinth, and other temporary labyrinths that keep changing and evolving!